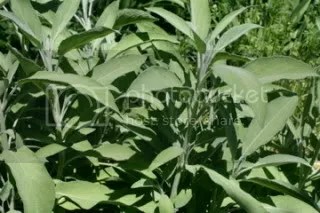 The Damsel has a lot of sage growing in her herb garden. It makes her happy, but she’s been wondering how she’d use it. Her recipes calling for sage all specify “rubbed” sage, not leaves. Rubbed sage has a unique look. Sort of spongey. Not like dried leaves at all. So, the Damsel worried. How would she make stuffing with a bunch of big leaves? 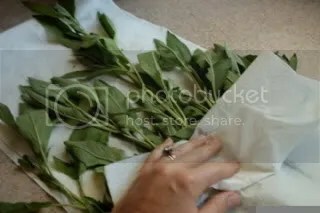 But, after several twinges of nervousness, the Damsel learned it’s quite easy to make your own from fresh sage. The drying process is just like we did with lavender. Pick a nice bunch. This was about ten stems. Wash and dry. No bugs allowed. 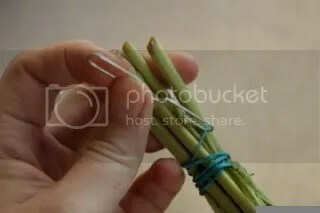 Secure the ends with a rubber band, and bend a paper clip into an “S” for a hook. Hang upside down somewhere it won’t be disturbed. The Damsel used her powder room, because it has no windows and is usually dark. Plus the sage looks fancy hanging from the scrollwork of the mirror. Wait till the leaves are crispy-dry. It took ten days for the Damsel. She hates waiting. She almost died from the waiting. She could have laid them in the sun and they’d have been dry in no time, and color fading doesn’t matter so much with sage. But sometimes she doesn’t act in a completely logical way. 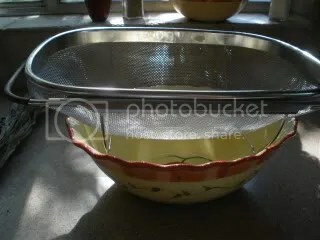 Find a fine mesh strainer and put it over a bowl. 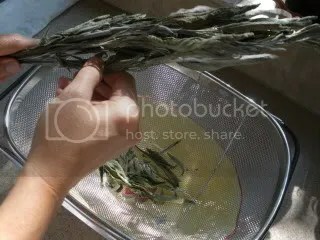 Pick the leaves from your bundle, putting them into the strainer. You won’t need the stems. 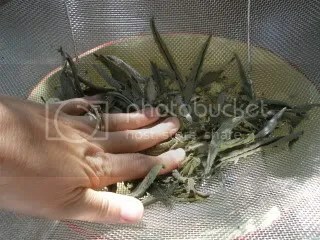 Press the crispy leaves through the strainer by rubbing them against the wire mesh. Discard any little sticks. In the bowl you will find . . . rubbed sage. Spongey and everything. The Damsel was surprised. And excited. And amused, to tell you the truth. She had her doubts this would work. She thought there would be just dry, crumbled pieces of leaf. But it did work, simple as that. And the smell. Oh the heavenly smell. The Damsel went immediately out to her sage plant and picked more, so that in ten more days she will smell that heavenly smell once again. And the powder room will be fancy again. Y’know, I’ve always wondered what rubbed sage was. Thanks for filling me in! 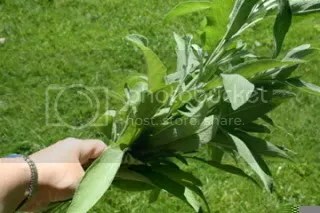 Those are the biggest sage leaves I’ve ever seen! Makes my plants look all punky and little. But when they grow up, they’ll be rubbed sage too. Your sage seems to be thriving! My sage plants are very small in comparison. What type of sage are you growing? 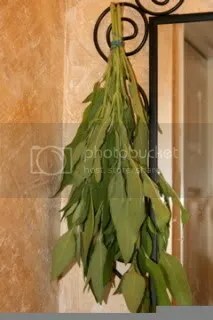 It’s so kismet that you posted on this topic, I was just wondering yesterday how to make rubbed sage! Thanks for the post! That sage is a little ridiculous, isn’t it? The plant is several years old, so perhaps that’s why the leaves are so big. The smell when I was rubbing it…it released that sage smell, of course, but it was MORE. It was almost a Christmassy scent. Can’t describe it. How cool! The herb garden isn’t so easy to come by though. :^) I was doing well to get veggies. Herbs are easier in some ways than veggies, so don’t give up. Most of them are perennials, so once they get established, you don’t have to do much. I, too, never saw sage that large; it is impressive. Thank you for the tutorial. 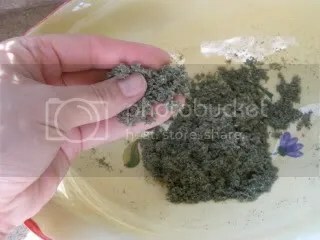 In the past I have put the dried whole leaves in jars and tried to rub them between my fingers over the cooking pot when I needed them. I usually ended up with balls of sage rather than flakes. Using a sieve makes so much more sense. I think, though, that I will wait until I need it to rub it. I presume the flavor and scent will be stronger if left in the leaf state because there is less surface area exposed to air in the jar. I have never researched this issue so I may be completely wrong. Thank you, too, for leaving the lovely comment on my blog. I’ll bet you’re right about the flavor and scent being stronger right after it’s rubbed. I once came across a recipe substituting sage for basil in pesto. I do some every year, it’s heavenly. It freezes well.